This Breakfast Shepherd’s Pie has a meat and egg filling and a crunchy hash brown top. Everyone I know makes shepherd’s pie a bit differently but there are two things that are always the same: ground beef and mashed potatoes. 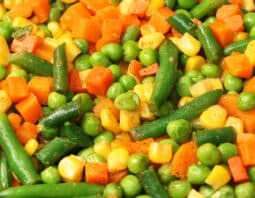 Some people mix peas and carrots into the beef, others throw in corn. I’ve seen it all! Today we’re going to do something a bit different. We’re going to make a Breakfast Shepherd’s Pie! Shepherd’s Pie for breakfast? Yes! The first thing that you should know is that instead of mashed potatoes, I use classic breakfast potatoes: hash browns. Hash browns are very much the breakfast potato of choice in our house and they are a staple in diners and kitchens throughout the country. 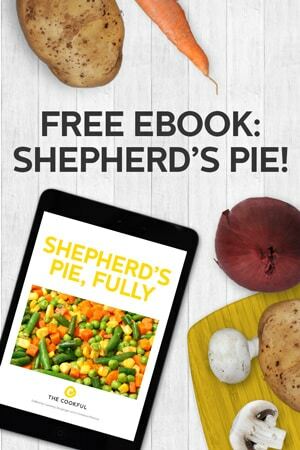 The second thing about this breakfast shepherd’s pie that you’ll find different is that it calls for ground sausage instead of ground beef. We wanted it to be similar to the original, yet more like a breakfast dish. So enter sausage, stage right. Also, we added eggs which fluffed up in the ramekins with the sausage mixture. After all, what is breakfast without eggs? This recipe requires you to be pretty strategic with the timing. 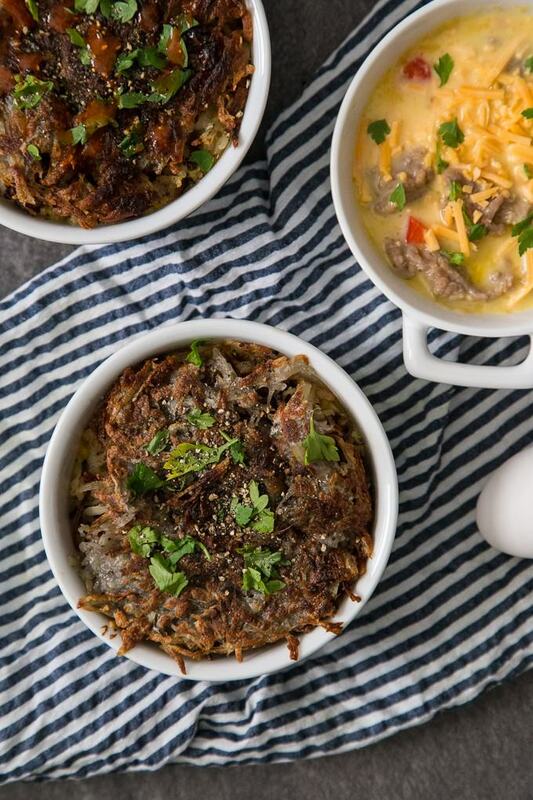 You want to get your hashbrowns going first and then while they cook (since they take 15 minutes for each side) you can work on cooking the onions and garlic, browning the sausage, cracking and mixing the eggs with the milk and cheese, etc. One thing about this recipe that you should not skip is removing the extra moisture from the shredded potatoes by placing them in between two paper towels. You might have to do this a few times to really get it all out. After shredding the potatoes, place them between two sheets of paper towels to remove excess water. Place 2 tablespoons of the olive oil in a large skillet. Heat over medium-low heat and add the shredded potatoes, pat down and form a circle. Let cook on one side until browned underneath, 10-15 minutes. Place the remaining olive oil into a medium skillet over medium heat. Add the diced onions and cook until softened, 2-4 minutes. Add the ground sweet Italian sausage and cook until brown. Add parsley and chopped red pepper near the end of cooking and cook for about a minute longer to soften the pepper. 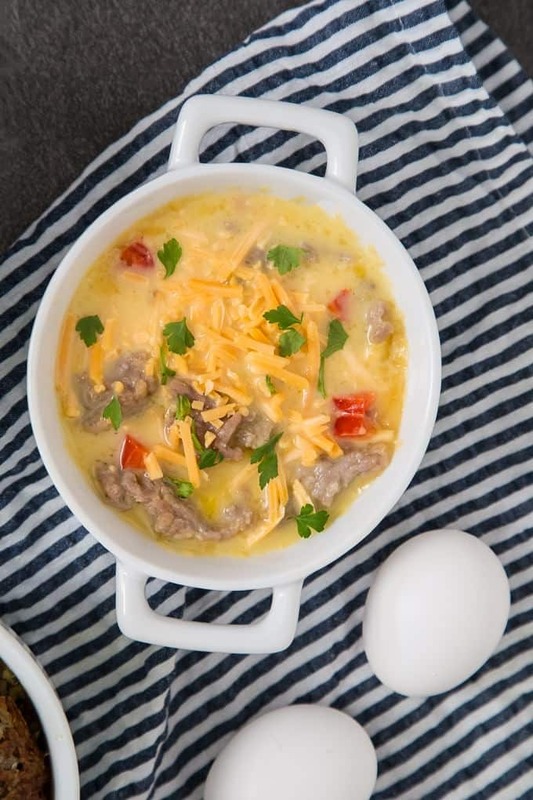 In a medium bowl, mix together the eggs, milk and cheddar cheese. Place sausage mixture in 4 individual ramekins. 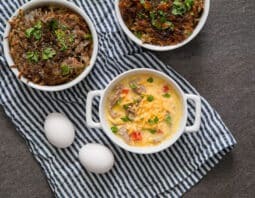 Pour egg mixture over top of the sausage mixture and bake in the oven until eggs are fully cooked, about 30-35 minutes. After potatoes have browned underneath, flip using a spatula and continue to cook until other side is well-browned, 10-15 more minutes. Drizzle more olive oil onto the pan if needed. Once eggs are cooked and hash browns are done, divide hash browns and put some on top of each ramekin. Garnish with more parsley, cheese and hot sauce, if desired. This post originally appeared in March, 2016 and was revised and republished in April, 2018.